Jana and Gavin Dluehosh’s St. Johns’ rental is one of more than 200 homes in the Portland area owned by American Homes 4 Rent. When Portland’s public housing advocates cooked up a plan to demolish and rebuild Columbia Villa — the low-income housing complex in North Portland that began as lodging for wartime shipbuilders — theirs was a vision of inclusion. The idea was to foster true socio-economic diversity by creating a community where people of different financial means could live side by side. Front porches were turned to the street. Nonprofit partners signed on. And by the time they were done, 622 crisp new rental apartments were set aside for seniors and low-income earners and nearly half of 226 houses were built by nonprofit groups that subsidized the cost. The rest were fair game for anybody. So it was that in 2014, the national real estate firm American Homes 4 Rent took hold of two homes in New Columbia, rolling them into a new and potentially risky financial instrument. 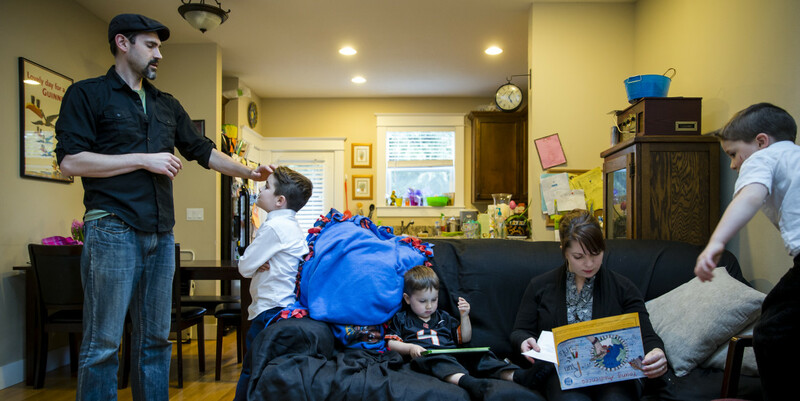 The scenario illustrates how American Homes 4 Rent, a publicly traded company, has taken hold of more than 200 Portland-area homes, making Wall Street interests the landlord for working- and middle-class renters. It also illustrates how that trend is changing neighborhoods. On a Tuesday in August in New Columbia, you would never know. No sign of NASDAQ traders. No investment analysts roaming the streets. Instead, a few policemen stand in McCoy Park, showing off their motorcycles to a group of curious kids. A handful of boys play soccer on the new turf field. Down the road, the only whiff of Wall Street is an innocuous lawn sign outside a home on Fessenden, advertising the three-bedroom, two-and-a-half bath house for rent by American Homes 4 Rent. The rent was set at about a dollar per square foot, or $1,925 a month. It seems, save for the sign, a very ordinary house. Built by Legend Homes, it was sold to a private homeowner in 2006, who sold it to American Homes 4 Rent seven years later for $235,000. Only afterward did the house became part of a burgeoning financial trend in real estate, acquiring a new owner — Wall Street stockholders — when it became one of 4,487 single family homes the company used as collateral in a bid to raise $513 million from investors via Goldman Sachs. Since then, stockholders own this house, and American Homes 4 Rent returns steady payments to them on that $513 million loan. It’s the same story around the block — another American Homes 4 Rent house owned by Wall Street stockholders. There are six other houses in Multnomah County that were used to back that particular bond sale, three of them in Portland, the other three in Troutdale and Fairview. It’s not clear how many of the 204 houses American Homes 4 Rent holds around Portland are truly owned by Wall Street because the company runs its operations through more than 85 subsidiaries. But for the publicly traded landlord, one thing is clear: their investors expect to see a profit from renters. As American Homes 4 Rent continues to acquire homes, the company reported revenues nearly tripled between 2013 and 2014. “It sounds like a situation that’s just adding to the problem of affordability and market pressures around these kinds of agreements that force families out. It makes it all the much harder for us to serve people who really desperately need housing or affordable opportunities,” said Diane Linn, executive director of the non-profit real estate brokerage Proud Ground, which uses land trust dollars to make houses permanently affordable and expand homeownership opportunities to lower income people in Portland. Efforts to reach American Homes 4 Rent for comment were unsuccessful. 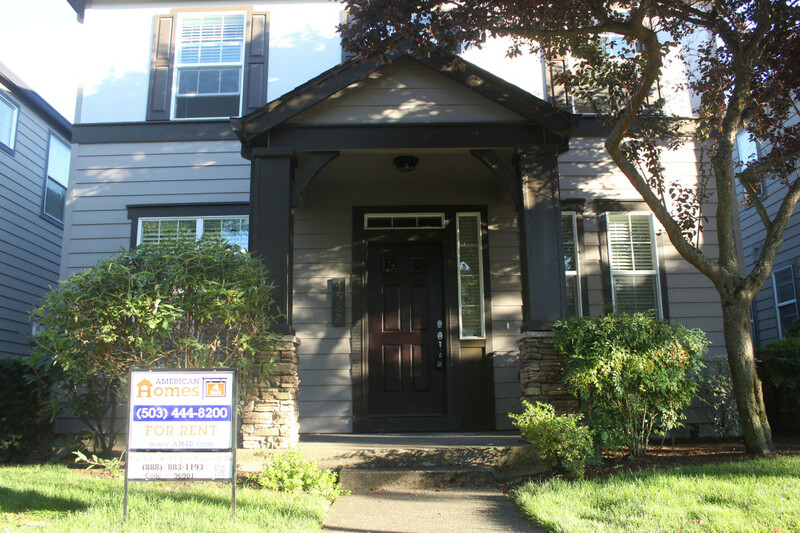 Locally, American Homes 4 Rent was among 26 companies and individual investors that purchased more than 10 homes each for cash in Multnomah County between 2006 to 2014, according to an InvestigateWest analysis. That analysis showed those cash buyers were competing directly with traditionally financed homeowners for real estate, a phenomenon that contributed to rising costs. Such Wall Street investment is normal in the multifamily market — investors own gobs of apartment buildings in major cities through rental-backed securities. But bond sales backed by rents on single-family homes are a new and unregulated financial tool. They were invented by The Blackstone Group, the global capital investment firm, after the company spied opportunity in the financial crisis and purchased tens of thousands of distressed homes, then sold the first such bonds in 2012. Before then, the single-family rental business was run by private or individual investors in local markets — your typical Joe Landlord or rental company. Now, thanks to bond sales like the one backed by the homes in New Columbia and elsewhere, companies like American Homes 4 Rent have more than a foothold in the industry. As of June 30, American Homes 4 Rent owned 37,491 houses in 22 states. The company typically rents to families, targeting homes with three or more bedrooms constructed after 1990, according to public statements by corporate officials and filings with financial regulators at the U.S. Securities and Exchange Commission. There are other companies like it, all raising capital through bond sales. The Portland home of Jana and Gavin Dluehosh. The noise was piercing: a high pitched, searing siren from somewhere within the walls of Jana Dluehosh’s St. Johns’ rental. When it began about 9 p.m., Dluehosh feared she’d set off a smoke alarm, but couldn’t reach it to check. After husband Gavin arrived home, they worried the deafening sound was a carbon monoxide detector. “It was ringing, reverberating,” Jana said. It was a skinny house with high ceilings and skylights over the living room. The sound seemed to come from everywhere. They put their three boys, then aged 2 ½ to 8, into their car and called authorities. Baffled firefighters found no excess carbon monoxide. They cut the power to the house. No effect. Gavin Dluehosh called his landlord American Homes 4 Rent. He reached maintenance workers first in Idaho, then Utah. The advice: Disable all the smoke alarms. That didn’t work either. After spending the night with friends, the Dluehoshs arrived home. Still the siren wailed. American Homes 4 Rent summoned first a plumber, then an electrician. They checked the attic, the crawlspace, a sump pump. Nothing. Slowly, somewhere, the batteries ran out of whatever caused the sound. The noise grew fainter, sputtered and was gone. Later, American Homes 4 Rent billed the Dluehoshes $442 by for making a frivolous maintenance call — more than a quarter of their rent payment. The Dluehoshes successfully fought back against it, but such charges are not an anomaly. They are part of a financial strategy. In public filings with the U.S. Securities and Exchange Commission, American Homes 4 Rent makes clear that maintenance charges — referred to by the company as “charge backs” — and other fees are part of a new effort to offset the cost of owning the homes. These kinds of charges to renters are becoming a significant source of revenue for the company. In 2013, American Homes 4 Rent earned $5.2 million in fees and charge backs, or 3.8 percent of its total revenue of $137.9 million. A year later, that figure ticked up to $20.9 million, or 5.3 percent of revenue that climbed to $397.2 million. This year, the company has already exceeded those earnings, netting $23.9 million in just the first six months, 8.4 percent of total earnings. Company officials did not respond to requests for interviews. But a recent earnings call for investors — which by law must be held publicly — made plain the pressure the company’s leadership faces from its investors. Brokers from JP Morgan, Morgan Stanley, the Jefferies group and others questioned why the company wasn’t raising rents higher faster, and if American Homes 4 Rent could be expected to perform better financially in another three months. While the company’s own public filings spell out a plan to stabilize occupancy, then raise rents between 3 and 4 percent annually on stable tenants, stock brokers were doubtful. In the last quarter American Homes 4 Rent only increased rents between 2 and 4 percent, while their publicly traded counterparts in the multifamily sector — an arena with which brokers are more familiar — raised rents 9 percent, brokers said on the call. “People are giving us more scrutiny for raising rents on families,” CEO David Singelyn told them in response, adding that tenant turnover is costly and that it is better to hold occupancy steady. He noted multifamily rents weren’t rising fast when that sector was adding inventory either, suggesting that American Homes 4 Rent is still acquiring houses and hasn’t yet hit its peak earnings phase. This tension between what investors expect and the rent increases the public will tolerate worries observers of the industry. American Homes 4 Rent and companies like it have been credited with a few things: providing new rentals in a market where rental housing tightened, and putting homes back in circulation as they came out of bank foreclosure, in many cases clearing out squatters and putting neglected housing back in good condition. In its 2014 annual report, the company noted it spends up to 25 percent of a home’s estimated value on renovation. But as the company is increasingly shaped by investor interest — stockholders include fund managers like the Vanguard Group and real estate investors like Cohen and Steers and CarVal — there are questions from tenant advocates and researchers — groups like the Center for American Progress, the Right to the City Alliance, and independent researchers like Desiree Fields — about what kind of landlords these companies will be long-term. “It would be interesting to look at the outcomes of these different types of investors. Are they more likely or less likely to get into financial distress? Are they more or less likely to maintain the properties in good condition? Are they more or less likely to evict tenants?” Fields said. A house in the New Columbia neighborhood of North Portland is advertised for rent by American Homes for Rent. You don’t have to look far to see where the $513 million went after it was borrowed by American Homes 4 Rent. Beaverton, in fact. After the money was raised by putting the New Columbia and other homes up for collateral, American Homes 4 Rent quickly bought up most of the houses in a subdivision off Baseline Road known as Steele Park. All told, the company owns at least 29 of 74 houses here. It’s typical Beaverton in most ways. Save for a few houses filled with rooming adults, there are lots of families, their front porches decorated in children’s bicycles, barbecues and floral arrangements. Many residents contacted for this story were unclear about who owned their homes, although some noted a shift in property management about two years ago from a local company to American Homes 4 Rent. The rents are mid-range for houses with three and four bedrooms in Beaverton. They have two or more bathrooms and private garages and yards and are within walking distance of Elmonica Elementary School and a few stores. He said he likes the online bill pay system — American Homes 4 Rent bundles all of his utilities into one fee, along with rent. And while there’s a service charge, he says he gladly pays it. Water, garbage, electric and gas, done in a few clicks. Longer-term tenants, however, noted a distinct change when American Homes 4 Rent took over: some rents went up dramatically. Lawn maintenance ceased. Several observed a steady creeping of fees. The company expected them to pay for plumbing problems and other maintenance. And American Homes 4 Rent does not provide pest control. Some residents said they struggle with rat infestations. In its 2014 annual report, American Homes 4 Rent’s top officials said they hold the line on property maintenance at $450 per home per year. A 2013 reorganization also was intended, in part, to control maintenance and renovation costs. 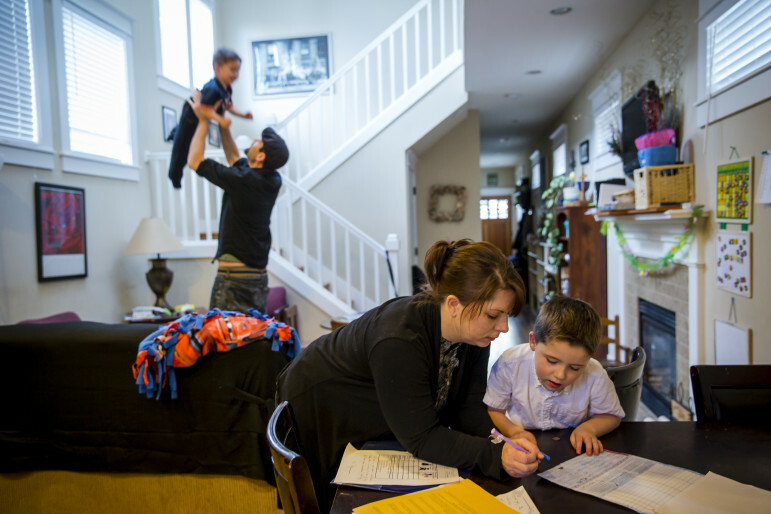 California researcher Aimee Inglis, member services and volunteer coordinator of Tenants Together, said that’s consistent with other national landlord companies. Tenants Together canvassed California renters at homes owned by three national landlords operating under the same model — Waypoint Homes, Colony American Homes, and The Blackstone Group’s Invitation Homes. The advocacy group heard from 75 tenants in response, who in May reported their average rents and obligations as renters. “What really overwhelmingly blew us away, was that it was pretty consistent: no matter what the landlord was, no matter what the investment company, was that they were charging above median rent for the area… and that they were expected to saddle a lot of the burden of home ownership,” Inglis said. She said that style of management, combined with new trends showing some investor landlords are beginning to offer loan services to smaller companies in lieu of buying more homes, suggest the companies may ultimately offload their holdings to other investment firms. “I don’t think the trend is toward home ownership,” she said. An InvestigateWest reporter attempted to contact American Homes 4 Rent through its Portland service office (located in Utah), through its headquarters in California, through email and through the company’s 1-800 number. Company officials did not return calls, or take InvestigateWest’s questions during a public earnings call. The New Single-Family Home Renters of California, May 2015, Tenants Together. The Rise of the Corporate Landlord, July 2014, Right to the City Alliance. Renting From Wall Street, July 2014, Right to the City Alliance. Meet the New Landlords, Summer/Fall 2014, Center for American Progress. When Wall Street Buys Main Street, February 2014, Center for American Progress. America’s Rental Housing, 2013, Joint Center for Housing Studies of Harvard University. As a person in the middle of an active, intensive search for a rental house in Portland, this makes me sick. Where can I find a list of the subsidiaries, or even better, do a search for all of the homes in my search area that are supporting this scheme? Do the investors know about the 9.0 earthquake that’s going to happen? This is a risky place as even if their houses are still standing the place will be a mess for a long time. Thanks for reading, Ali, and good questions. American Homes 4 Rent lists all of its for-rent housing on its web site: http://www.americanhomes4rent.com. You can find more information about specific properties there. You may also be able to ask property managers who owns the homes they advertise as you shop. As for subsidiaries, you can find a list up above in the library (just hit that number 7 and it will take you to related documents). The subsidiary list is document 5. Do you have a list of who is investing in AMH4R? I would like to know who is profiting off of artificially rising rental rates. I’ve keeping track of some of these companies for about a year. They’re all in trouble. I think we will start seeing them fail within a year or two. I feel sorry for the people who have bought homes in the last three years during the new, extra large housing bubble. These companies are single-handedly responsible for this latest bubble as they have purchased hundreds of thousands of homes. Stock market bought their lies. These rental home bonds are highly risky and will probably crash fast and hard when that time comes. –costs of operating thousands of rentals over a vast geographic area are much higher than previously thought due to maintenance and low occupancy rates. Now the stocks of these companies are starting to tank due to their poor earnings. –Blackstone has dropped almost 20% in the last 3 months. –American Homes for Rent stock initial offering in 2013 was $15.80, on 9/11/2015 it was trading at $15.67/share. Its stock has never gone above $18.50. –Silverbay Realty Trust had an initial offering of $18.24/share Dec, 2012. It peaked at $21.99 by Jan, 2013. Today its trading at about $16/share having lost $6 per share since its peak. Pattern is easy to see if you’re willing to look.